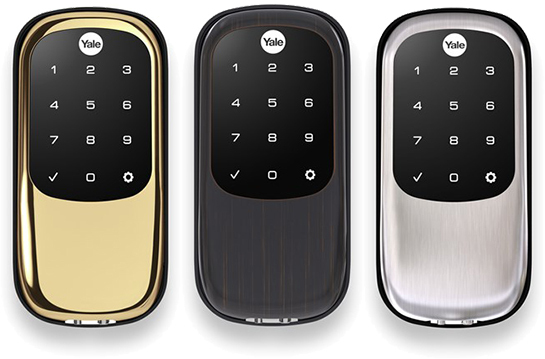 I use the touchscreen Yale Real Living lock. I ordered the Z-Wave module and the lock as soon as they became available (a nightmare process as no one had any knowledge of these slide in radio modules) but never installed the module or bought a Z-Wave home automation hub. Fragmentation in the home automation space kept me from finding a solution to integrate every device. HomeKit is making major headway this year, the floor at CES showcased more products than we’ve seen in previous years. These locks ability to switch between Zigbee and Z-Wave modules was one of the selling points, and I hope that the HomeKit module will retro-fit older models as well. UPDATE: Retro-fits only work in the latest generation locks. If you have an original Z-Wave lock it will not accept the new module (according to customer support).